How is it different from a 'led' Ashtanga class? same thing at the same moment with verbal cues from the teacher at all times. Everyone still does the same sequence of poses, but at his/her own pace. This style of teaching allows students to receive more individual attention and physical adjustments from the teacher. Do I have to be advanced, or can a beginner to Ashtanga or yoga attend? The more experienced students can practice independently with the teacher giving them assistance in the areas that they find most challenging, and for beginners more time is dedicated to giving them instruction on learning the sequence, they will be given a few postures at a time so that they can memorize them in the right order and they may repeat shorter sections of the sequence to help them remember it. There are also some sheets of postures to refer to if needed. Why is it slightly longer than other classes? This class is slightly longer so that students can attend at any time which suits them, as long as you give yourself enough time to complete your practice including relaxation at the end. This could be as short as 30 mins or up to 2 (1.5?) hours. What are the benefits of practising at Mysore style classes? The student will receive more individual support from the teacher and can do their practice at the pace that works best for them. As the practitioner learns the sequence and becomes more independent it gives them the opportunity to cultivate a personal yoga practice that they can do at home or anywhere in the world. Instead of passively listening to a teacher or watching others the practitioner leans to find their own focus making it a more personal and meditative practice. Ashtanga is traditionally a morning practice and all the classes in Mysore, India are in the morning and always have been. Practicing first thing in the day is a wonderful way to start your day! 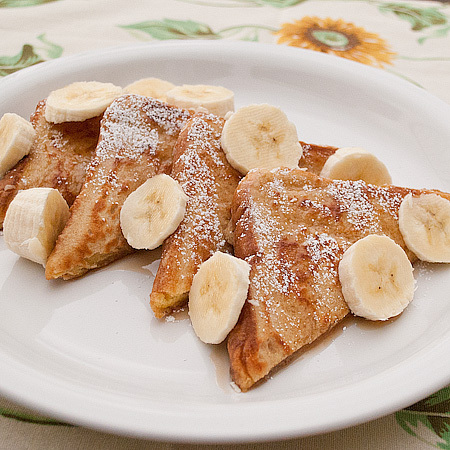 French toast with bananas! Last week, in Jozef's Saturday yin class, we stretched out and bended into a 'banana' pose. As I was "just letting my random thoughts pass", I had a (passing) discovery: I was craving a bananas, cinnamon and gooey bread. So I invented the perfect vegan banana french toast ! Blend bananas, soy milk, cinnamon (+spices), and vanilla. Dip bread slices into the mix, coating both sides.Do not soak the bread so it drowns!!! Fry in margarine in medium-hot skillet until golden. Serve with maple syrup (or more bananas) if desired, and enjoy your lovely breakfast! While this recipe will not feature on our menu on the vegan dinner with Mark Stevens (Sat 1st Dec 2012), it is a fantastic way to start the day !